McBASTARD'S MAUSOLEUM: KALIFORNIA (1993) Collector's Edition arrives March 5 from Shout! Select. 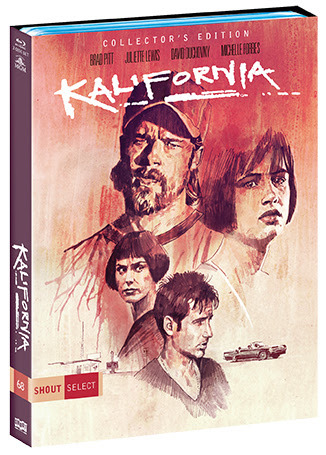 KALIFORNIA (1993) Collector's Edition arrives March 5 from Shout! Select. When urban intellectuals Brian (Duchovny) and Carrie (Forbes) set out on a cross-country trip to research a book about serial killers, they share the ride with a couple they barely know — Early Grayce (Pitt) and his girlfriend Adele (Lewis). Locked in a car hurtling westward, the four travelers struggle to find some common ground. But when they finally do connect, Early's violent nature abruptly emerges and the terrified Brian and Carrie realize that they don’t need to go very far to learn about ruthless killers...because they are already face-to-face with one!